First time posting here. Rode the FZ-07 at the AIMEXPO in Orlando. As background, I have 25 years of riding experience, many thousands of miles on Sv650, R1, GSXR750 and CBR1000. In summary, I was SHOCKED at how much power the bike has!! I cannot believe that 689cc budget bike will power wheelie like that!!! It would come up in first like it was nothing! Couldn't really evaluate handling or braking on the test ride, but really like the bike. 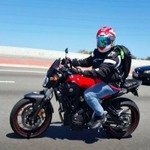 I also rode the FZ-09 and actually prefer the 07. The 07 was just more fun. I also rode the new GSX-S1000 naked. They are going to sell a ton of those. It felt like my '08 CBR1000rr with a handlebar. But it wasn't as fun as the 07 because you just can't play around on the street with it like the 07. It will go 90mph in first (didn't actually go that speed but 45mph was about half way to redline). Been there, done that. You guys have a real special bike! Will be buying one next weekend! Very cool and thanks for feedback about the FZ-07. Yamaha really did hit the mark with this bike (especially the motor). Fo' sho'! I enjoy riding this thing so much. My fiancé is jealous because I ride to work any time it's nice enough to do so, and she can't. Coming from an '08 Street Triple, I have to say that this bike has a lot more low end torque and the front does come up much easier. Top end, though, not so much, but how often do you really get to do 100+ off the track? I think this bike hits the sweet spot nicely. It's quick, it's light, and it's cheap (but not built cheaply). welcome to the club, red is the best! Awesome, another FZ rider in Orlando, welcome to the club! Well, I followed through with what I said in the first post. Bought a '15 red yesterday. Such a sweet bike. Riding position is perfect for me and the "too soft" suspension is great on my crappy streets. The owners manual said nothing about wheelies during break in so I figure it's OK! So much more fun than the liter bikes I used to think I "needed"! I can play at a speed I might survive a "get off"! Good on you Stevent1967! I agree with you, sometimes I just go for a quick squirt around the block because the bike is so much fun! "...buying one..." GOOD for YOU!! !